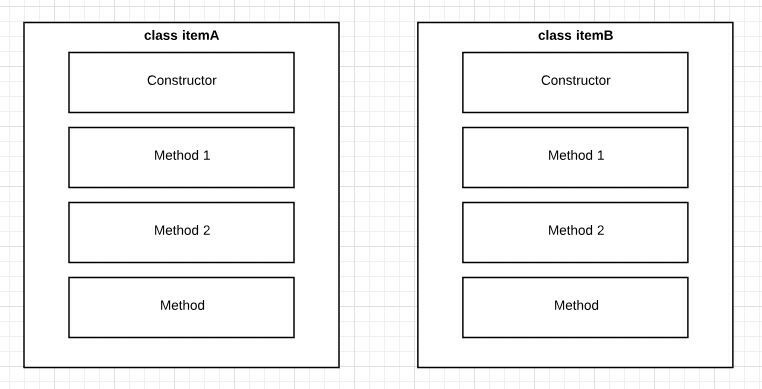 It looks like a class, it smells like a class but it’s not a class — so forget what you know about classes and object oriented programming for a moment if you want to truly understand the concept of prototypes. No. I lied. 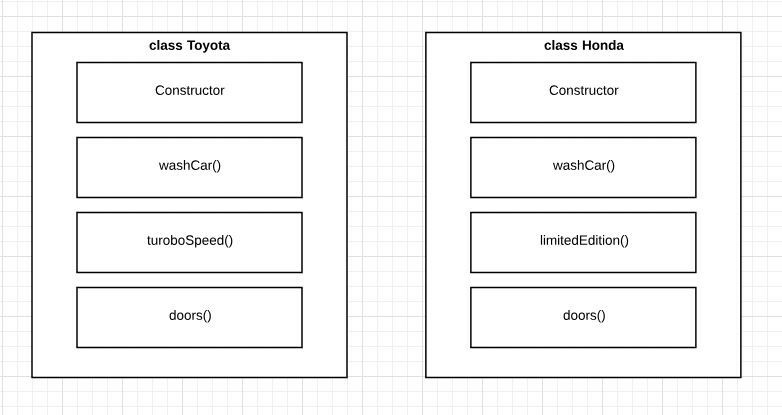 Let’s have a quick look at how traditional class based object oriented programming works. Traditionally, object oriented is often taught and represented as a blueprint. The idea is that everything is an object as some sort and all you have to do is create the ‘blueprint’ for that object and instantiate new ones every time you needed a unique instance of it. Look at me! I’m a class! Classes (not language specific) often have a constructor with methods that are called to perform some sort of action. They’re constructed this way because it gives clear boundaries and ring fences around objects — the idea being that all objects are ‘things’ and all ‘things’ have properties and functionality. However, reality isn’t always as clear cut and defining objects can often be difficult. You can share methods, create super and sub classes but that’s a different story. Some times, when you create a class, it can have duplicate features with another similar but not quite the same class. Just an example of what duplication can potentially look like. Prototypes — do you have a pen? A prototype is like a deconstructed class that are joined together through references. If a class is like a blueprint, then a prototype is like asking yourself — do I have a pen? if the answer is no, you ask your friend. If they answer no, your friend goes and ask their friend. The process continues until the final person doesn’t have a friend. Which will show up under prototype and let us call it when we instantiate a new object from the function. The prototype pattern works on the idea that a function/method is only written once and can be referenced and used by prototype objects through the prototype chain. Confused yet? Here’s a diagram. When you connect up the functions, the methods set inside the prototype becomes available from left to right. Anything in x and y is available to zbut not the other way around. Hopefully, that pen analogy earlier makes a little bit more sense now. There are 4 ways to initialize to create a prototype chain — but for this piece, I’m going to do an example of the new initialization pattern. I find this the easiest way to demonstrate prototypal inheritance and chaining, especially for those who are still trying to absorb and understand the idea. Lets start with an empty Car function. You can have stuff inside it but for the purposes of this demo, we’re going to leave it empty. 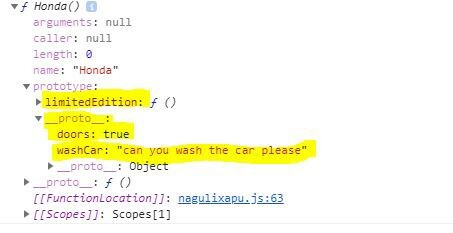 Now, when we console.dir(Car) this, we should see washCar and doorunder prototype. Let’s create another function so we can chain them up and get some inheritance going. We’ve got our Honda() function. Now we’re going to create a reference and linkage to Car by instantiating the Car function with new. To link up your Honda function with your prototype blueprint, just set HondaProto to Honda.prototype. Lets add one more function to the inheritance chain so you see the chain in console log form. Same pattern creation as above. This will now add another __proto__ nested inside console log output. 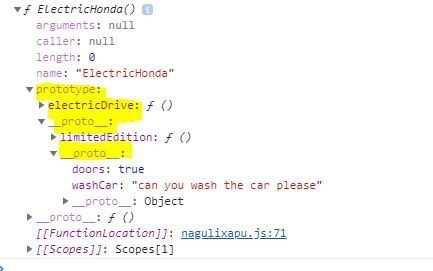 Now if you you initialize a new object with ElectricHonda() and call the washCar method, the object will have access to all the Car object’s methods and internal settings. Any changes that happens furthers down the chain is also inherited by the children. 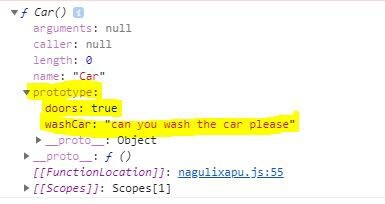 console log output based on what’s set on .washCar() at Car object. Although LX4576Honda doesn’t have any kind of washCar method available, it keeps going down the chain until it finds a match. 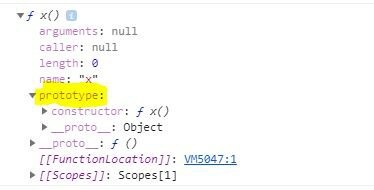 If nothing matches, then it will throw undefined. You can also have one prototype function attached to another chain and therefore share the function. The method of creating such a relationship is exactly the same illustrated above. Logically, if we continue to use the example so far, it should look something like this. The efficiency of prototypes and prototypal inheritance is that you’re not creating a whole new bucket to house all the methods inside. Rather, you’re just creating references to the functions and only call them as needed. With classes, those methods are sitting in the bucket and waiting to be called. Hopefully the above example makes a bit of sense to you and helps you understand prototypes a little bit better. There are other ways to initialize and create a prototype inheritance chain but for length and to prevent them from confusing you, I’ve omitted them from here and just showed you how to create an inheritance chain using new initialization pattern. However, you should go and check out Object.create, Object.setPrototypeOf and __proto__. These three listed alternatives are equally valuable and great alternatives for creating a prototypal inheritance chain. I‘m taking a personal depth year. Follow me to follow my journey. Currently a top writer. Tweet me. ITNEXT is a platform for IT developers & software engineers to share knowledge, connect, collaborate, learn and experience next-gen technologies.